In the afternoon of December 21, 2007, happy laughter and singing were heard in the "Chinese Class" of the Chinese Embassy in the UK. H.E. Mme. 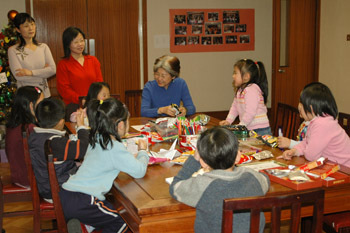 Ambassador Fu Ying celebrated Christmas and New Year with 9 students of the "Chinese Class" and their parents. The children welcomed with ardent applause when Fu Ying came into the classroom with a lot of delicious food. The children expressed their blessings to the Embassy with their naive and unadorned language: wish everyone health, success and happiness in the new year and have more time to play with the children! Ying chatted with the children and asked if they knew the origin of Santa Claus and if they had written letters to him. Student Diandian immediately answered that Santa Claus came from Finland and his answer won unanimous praise of all. Student Lele said that she had sent letters to Santa Claus but had received no reply and she was a little bit upset. The children sang English songs they learned in the <?xml:namespace prefix = st1 ns = "urn:schemas-microsoft-com:office:smarttags" />UK like Rudolph the Red-Nosed Reindeer, We Wish You A Merry Christmas and Jingle Bells with correct pronunciations and lingering charm. Their performance won praisal and exclamation of their parents. 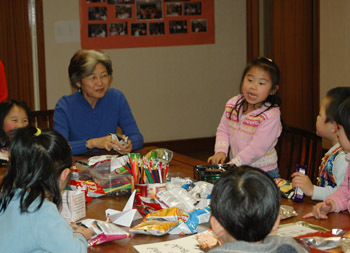 Fu Ying presented the children with New Year gifts and wished them healthy growth. The Chinese Embassy in the UK takes the building of a harmonious Embassy as top priority. It specially found a place and input resources to fund the Chinese Class, so as to provide an opportunity for the children to learn Chinese and reduce worries of endeavour staffs of the Embassy. Foreign Minister Yang Jiechi praised this meaningful when he inspected the Embassy last December. The Embassy is sticking to the spirit of human-orientation and creating a better study and living environment for all staffs as well as children.